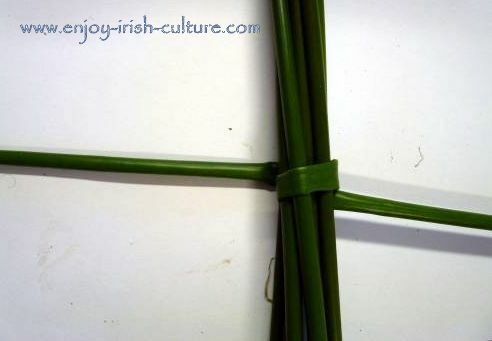 This is the second part of the instructions of how to make a St Bridget's Cross. 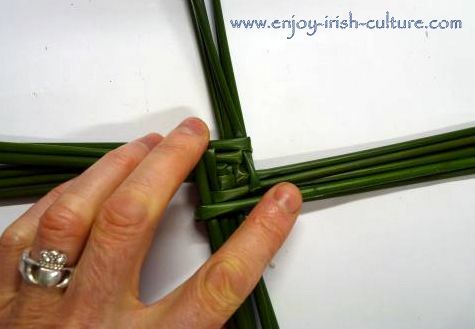 In the first part we showed you how to start the weave and how to hold it down on the table to make sure the centre stays together tight. 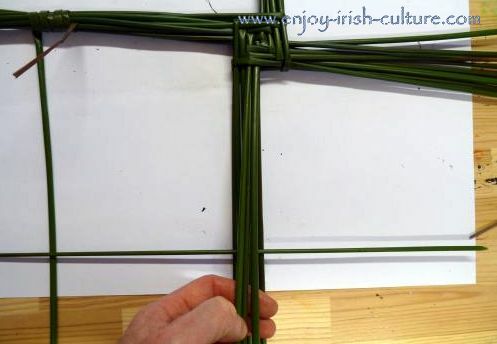 Now we'll be showing you how to complete the cross using only rushes and no man-made materials. Go back to the first part of the instructions here. 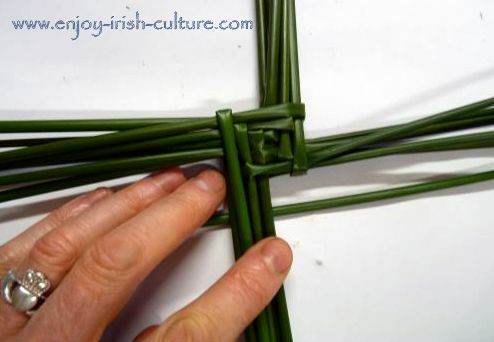 Keeping the centre of the cross secure with your fingertips, place another rush under the bottom portion and repeat the process as before, always folding around to the right and rotating the cross clockwise by one quarter. Same procedure again. The cross is really taking shape now! Make sure to keep the centre secure. Now you're getting the hang of it. 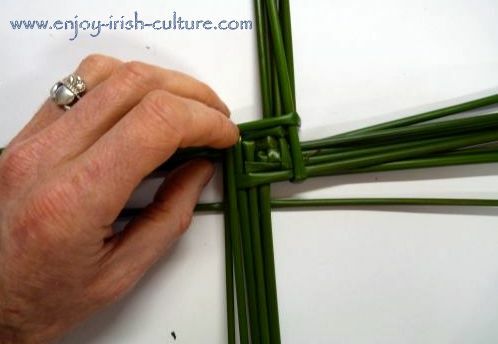 For something that looks complex and intricate the process is quite simple. Just remember to keep rotating clockwise and folding the rush around the bottom portion, pointing loose ends to the right. How many rushes you use is up to you, but this time I'm happy to finish off at this stage. 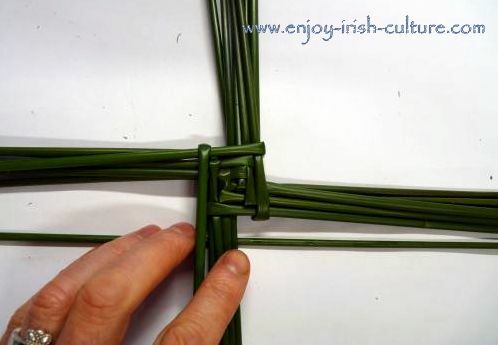 You can enjoy making a variety of crosses using more or less rushes. Now we're ready to fasten the loose rushes. No need for string or any modern materials. 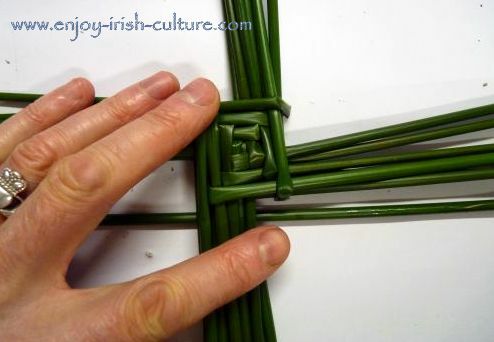 Just take a single rush and push it through the centre of the bunch of rushes on the bottom of the cross. 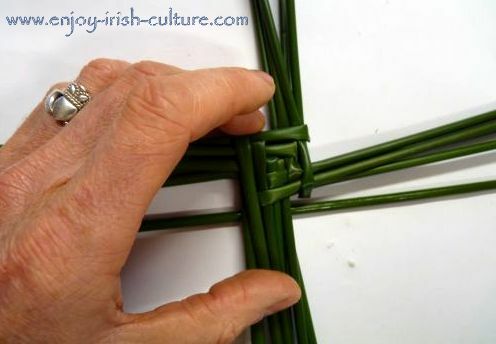 Fold the left hand side of the rush over the bunch, keeping it secure with your fingertips. 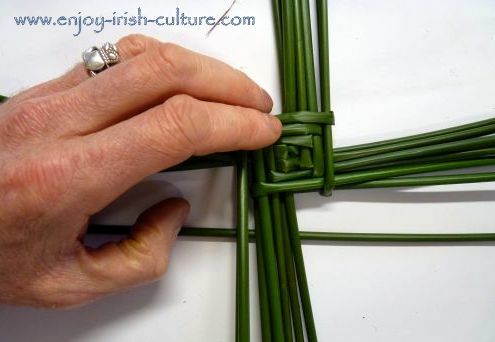 Take the part of the fastening rush that is on the left side and tightly wrap it two or three times around the leg of the cross, securing it by tucking it neatly through the bunch once. 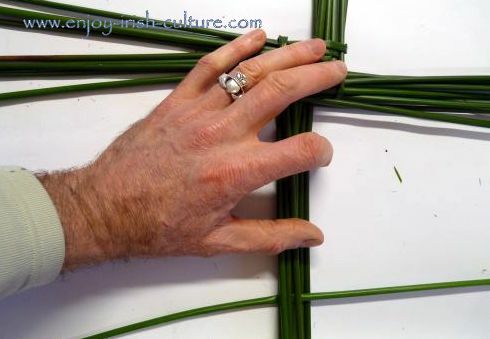 Next take the portion of the fastening rush on the right side and wrap it around the leg two or three times moving downwards, tucking the loose end through the bunch of rushes to secure it. 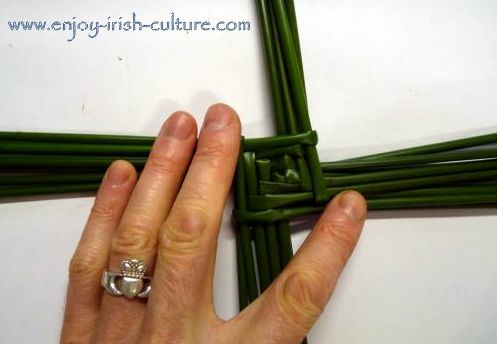 Find out here about Saint Brigid's life, about her miracles, and about her feast day and traditions. 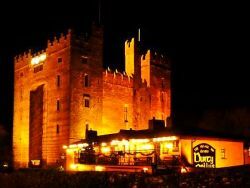 Find out about Saint Patrick here. 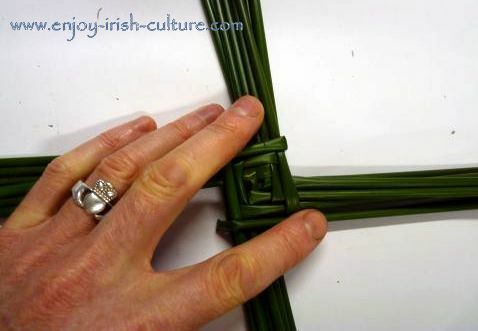 Rotate the cross clockwise and repeat the same procedure on the remaining sides of your Saint Bridget's cross. Now for the finishing touches. 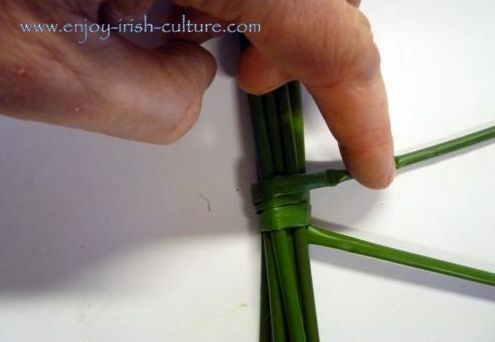 Using a scissors, trim the loose ends of the cross just outside the fasteners. 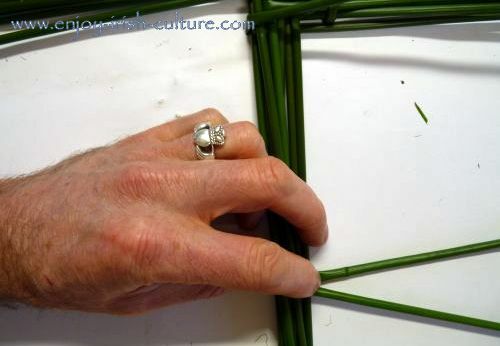 Trim the loose ends of the fasteners as close to the cross for a nice neat finish. 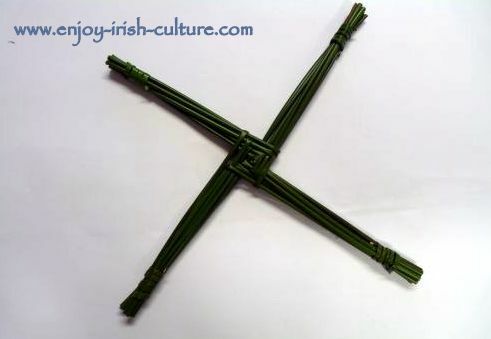 Your St Brigid's cross is now complete. Well done! 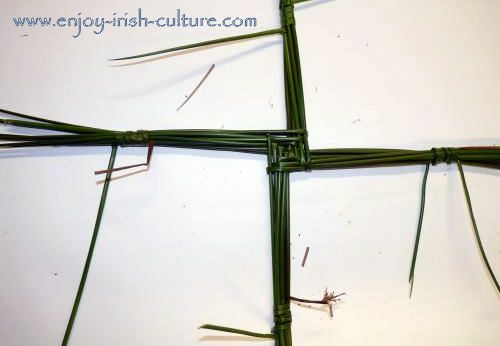 Over time, the rushes will dry out and will change colour turning brown. 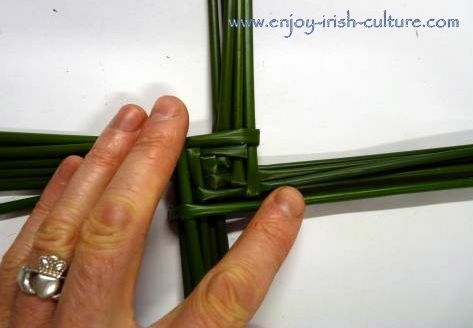 These Saint Bridgets Crosses are great fun to make and are beautiful Irish gifts to give and receive. 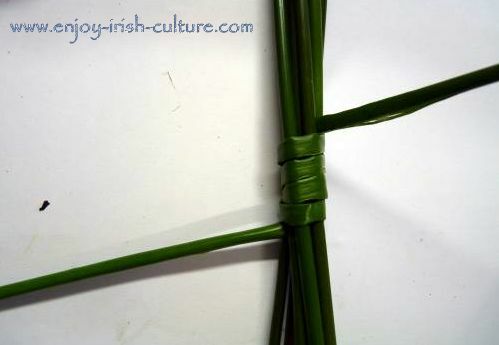 If you are not able to get hold of any rushes you could use reeds or straw. I've even seen kids use pipe cleaners or drinking straws. They make lovely presents for friends and relations. 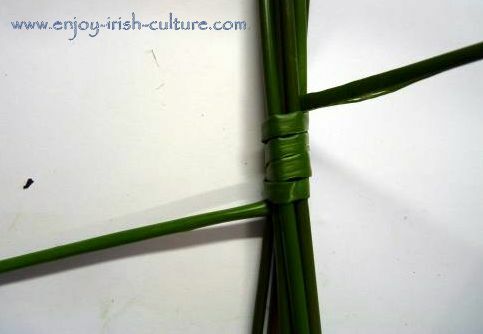 This Brigid's Day, why don't you treat someone to a little piece of Irish culture. 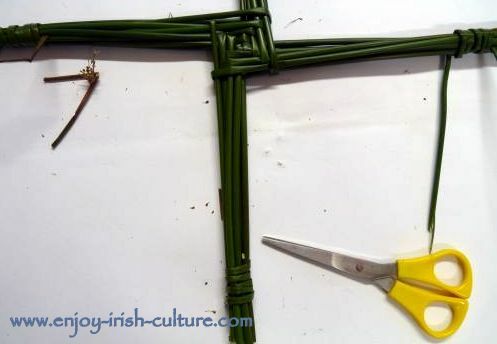 We hope you enjoyed our instructions for making a Brigid's Cross. May it protect your home and allow nothing but happy blessings to enter through your front door. We'd like to ask a small favour. Would you please, kindly, tell the world about our website so that other people, too, may enjoy our website that we are putting together for people like you as a labour of love. You will find social functions at the top left and at the very bottom of the page, just pick your preferred option.